A help-wanted ad for Rose Dufour and Elizabeth Brenner’s job might read as follows: Looking for a creative problem-solver willing to work flexible hours. Job may include late-night calls to foreign embassies. Diplomacy skills, patience, and the ability to solve complex puzzles a must. Knowledge of political science and oceanography a plus. This unusual job that Rose and Liz share is that of ship scheduler at the Scripps Institution of Oceanography. Scripps operates four research ships, the most of any research institution in the United States. Except when the ships are in harbor for maintenance, these ships are in constant use. Rose and Liz must figure out who is going to use which ship where and when. It requires a balance between two often contradictory goals. They need to provide the scientists with the tools they need, but make sure these tools are used as efficiently as possible. Throw in complications such as gaining cooperation from other countries, and the schedule becomes a multi-layered puzzle. The process begins when Rose and Liz receive a list of scientists with funded research proposals. The scientists submit their wish list: where they need to go, their timeframe, which ship and equipment they need. However, Rose and Liz must balance the scientists’ needs with practical considerations. It costs $20,000 per day to run one of the larger ships, so funding agencies, such as the National Science Foundation and the Office of Naval Research, apply pressure to limit down time and long transits. So, for example, Rose and Liz will try to avoid scheduling a ship for back-to-back cruises on opposite sides of the Pacific Ocean. 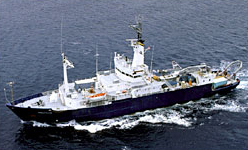 R/V Melville is one of the research vessels operated by Scripps Institution of Oceanography. Striking this balance requires patience, tinkering, and compromise. They may come close to completing a schedule only to have to rip it up when a scientist decides to makes a change or other complications arise. Often they must ask the scientists to alter their timetables or use another ship that is closer to where they want to work, including ships in other fleets. Fortunately, most of the scientists are cooperative and sympathetic. At the same time, other research institutions are piecing together their ship schedules. All institutions that operate research ships belong to a consortium called UNOLS (University-National Oceanographic Laboratory Systems). UNOLS members (Rose and Liz are the only female schedulers) meet regularly to coordinate their schedules and make sure the ships are used as efficiently as possible. Rose’s job-share partner, Liz Brenner. Finally, they arrive at a schedule that makes the scientists and funding agencies happy, but their work is not done. Many research cruises take the ships into foreign waters and ports. Rose and Liz must negotiate clearances through the U.S. State Department and embassies. For some countries, gaining clearance is a formality. Other governments, however, set up hurdles that vary from country to country. Governments with large bureaucracies may take seven months to issue clearances. Many governments require the ship to carry observers or scientific collaborators from their countries, or they may require the ship to collect data for them. Shifting political situations further complicate matters. During the scheduling process, Rose and Liz must anticipate these requirements, but even so, negotiations sometimes go down to the last moment. Frequently they find themselves on the phone late at night with embassies on the other side of the world, as the nervous scientists stand by. On rare occasions, complications arise while the ship is already out. 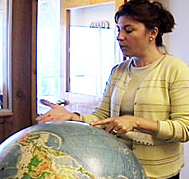 Rose once had to help diffuse a situation in which observers from two countries onboard a ship had a dispute over how data were being shared and tied themselves to the coring equipment, stopping all work. Rose and Liz’s unique job-sharing arrangement makes it possible for them to work in this challenging unpredictable career while staying involved with their families. Both are equals in every aspect of the job. They split their time at the office and take turns making the late-night calls to the embassies. They bounce ideas off of each other and offer each other support. But in order for this arrangement to work, they must communicate. Because they are constantly in contact with each other, they have avoided situations where one makes a promise to a scientist that the other doesn’t know about, or where both call an embassy to ask the same question. For Rose and Liz, the arrangement couldn’t be better. Read an interview with Rose. Get more info on Rose's background. See images of Rose at work. See Rose's typical work week. Other sites related to Rose's career.